Hospitals face increasing challenges and recent media reports highlighted a couple of these areas. News reports highlighted the use of latest technology, showing the benefits of robotic surgery and other innovative technologies. Whilst every management team strives for this the results show great variations in care provision throughout the country as indicated by the differing waiting lists, infection rates, uneven quality of operating theatres, medication errors and safety issues. The sheer costs of these combined issues would be astronomical given that costs of medication errors alone in UK hospitals to be between £200m-£400m in a 2003 report. There are solutions to these, which lie mainly in using IT. However, the two main drivers in getting these issues resolved are better-informed patients and also economic pressures, as key indicators would be tied to future reimbursement for hospitals. The main reason for increasing demand for care has been the increasing age in the UK population. In 1948, 11% of the UK population was 65 or over and currently this is 17% of the population, rising to a projected 22% in 2025. To add to this, real incomes have grown and also improvements in medical technology mean that patient demand has grown. There is no going back and many hospitals will in future have to re-organise around a narrower range of clinical specialties’, differentiate themselves on quality and service and get patients out of beds more quickly. There are indications that this is already starting to happen. Medical technology appears to be improving at an ever-faster rate and this includes new drugs coming on to the market. From the Da Vinci robot to other newer equipment are featured in the media costing several £m’s. These are without adding the cost of training surgeons and doctors’ on the use of these. In diagnostics, more expensive and powerful scanners are being brought out every year from CTs’ to more powerful MRI scanners, again costing nearly £2m-3m apiece. Every month stories abound of new cancer beating drugs that costs so much that the NHS either refuses to prescribe them or limits their use. All of these technologies can benefit the treatment and clinical outcome of patients. However, these new technologies will pose financial and other challenges to hospitals and avoiding employing these will only postpone the inevitable and possibly damage a hospital’s reputation in an increasing world of choice for patients. In recent times, there have been reductions in various nursing and other clinical staff in NHS hospitals to cope with growing financial deficits. Currently there are shortages of staff in the diagnostic modalities as well as medical physicists who plan cancer radiation treatment. Whilst national strategies are required to resolve some of these shortages, hospitals can go a long way in trying to alleviate these shortages by coming up with better recruitment packages, reducing incidence of absence, improving the workplace climate, use of flexible working hours and innovative benefits and using information technology to free up time. Without a concentrated effort, staff shortages will result in eating up precious financial resources. This is probably the biggest challenge facing hospitals since most of the other challenges end up putting pressure on budgets. 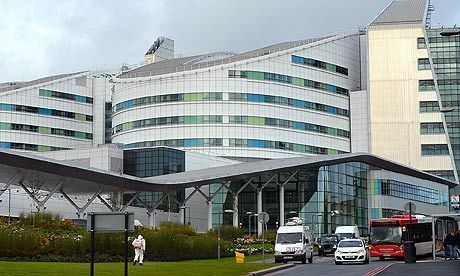 Since the recent efficiency savings enforced through some tariff reductions, NHS hospitals now also face pressure on their incomes and have to get used to managing their resources more effectively. With uncertain economic times ahead, government tax revenues can only go one way and this will put pressure on hospitals in the next few years. Managing staff, recruitment and retention will be paramount to keep a lid on the largest portion of a hospital’s costs. Part of this process must entail basic financial training for budget holders, most of who are not financially literate especially when they first get promoted to such a role. In addition, not only the Board of Directors and the senior management team but also budget holders and department heads must know what the hospital’s financial targets and operating margins are and why these have to be met. If managers with responsibility for financial results do not know these facts and are therefore not able to manage their budgets effectively then Finance Directors face an uphill and losing battle. In a 2007 US hospital executives’ survey, the top 3 challenges facing hospitals were found to be financial, hospital/doctor relations and quality of care respectively. Of these the financial challenges polled twice as much votes as the second most important challenge. All hospitals, whether NHS or private, face these challenges and whilst there maybe differences in how these can be dealt with in each sector, the common solution to both in the future is increasingly professional and innovative management embracing change. Change has to incorporate increasing efficiency and productivity in hospitals. Hospitals have to change their cultures and embrace change in a continuing programme of improving processes and learning. Therefore, the quality and adaptability of the senior management team is paramount in preparing the hospital to meet these challenges. Bright, dedicated, well-intentioned people work in hospitals and there is no reason why they cannot learn and assimilate as they have proven in their disciplines and rise to the occasion.